Shop Boss AW3 Dynamic Wah Pedal with Humanizer from AMS with 0% Interest Payment Plans and Free Shipping. 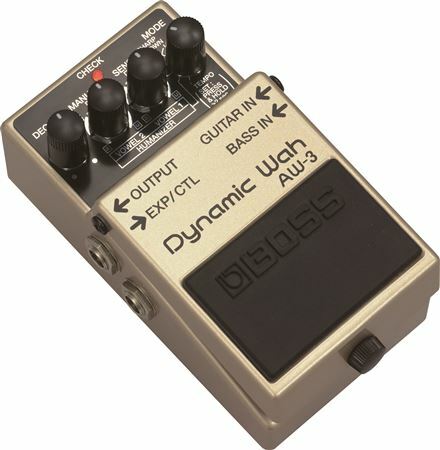 The Boss AW3 Dynamic Wah Effect Pedal is an incredible wah effect for Guitar or Bass! 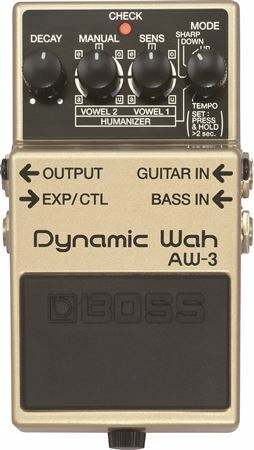 The AW3 pedal gives guitarists a wide range of classic auto-wah and dynamic wah effects (responsive to how hard you pick), plus a new Humanizer effect, which can simulate human voce-type vowel sounds. A dedicated Bass input even provides a variety of funky wah sounds for bass guitar. Tempo can be set for pedal control or at fixed rate via Manual mode. Boss backs the AW3, and all of their compact pedals with a limited 5-year warranty. This pedal has a good sound and performs well with proper technique. It's well built and if anything like previous Boss units, it should last a long time. Had it for about a year, works flawlessly so far. It's typical Boss. Great product, well built, easy to figure out. Weak bottom while playing bass through the bass input. Boss has been doing this for a very long time. I think they have the quality issue thing down to solid science. It's a Boss. Nuff said! AW's, in general, are a weird animal. I've tried quite a few and all leave something to be desired. Nothing I've heard can totally replace the old school rocker model for authentic wah sound. But the AW3 isn't bad at all. In fact, it is a cut above others in its price range. Even with its few downsides, it sure beats the archaic foot-pumping alternative. Here is where this thing falls a bit short. It will choke down your volume and thin out your tone, considerably. Not too much to be done about its thin sound but experiment with it in various places in your pedal chain. Find your sweet spot and leave it there. I tried it in every spot and for me it works best in front. Otherwise it chokes off the added levels of my boost and distortion pedals. YMMV so experiment. Looks good on the pedal board. Action? It's the lack of needed action that attracts us to AW pedals in the first place. Well, you get the point. I don't own this but a good friend of mine does and I plan on stealing it becuz its that awesome (j/k j/k) but yeah it kicks some major rumpus!